SeaLives is a Vancouver, Canada based non-profit using photography and journalism to connect audiences with individuals who impact, are impacted by, or otherwise face issues of ocean conservation in their daily lives, with the goal of better understanding and humanizing the day-to-day struggles of marine conservation in all its forms and the local cultures that depend upon the sea for survival. In this blog post, reporter Jason visits the Salmon Coast Field Station in the Broughton Archipelago, Canada. I arrived at Salmon Coast Field Station with one wet leg. Chris was polite enough not to mention it. Launching the rowing boat that I used to get from Billy’s place to the station had required me to walk along a pair of rain-soaked logs that keep the dock afloat. My right foot had slipped between the logs and I had gone in thigh deep on that side. Not an auspicious start to the morning, but after arriving at Salmon Coast things were looking up. Chris is one of two Station Coordinators of the facility he describes as a kind of hotel for research scientists – and occasionally artists – who come to the Broughton Archipelago to pursue their work. The hotel analogy isn’t quite accurate – you have to apply to get in. The Station was founded by local scientist and conservationist Alexandra Morton but she has distanced her activist activities from it so that the work produced by the Station is independent and unbiased. 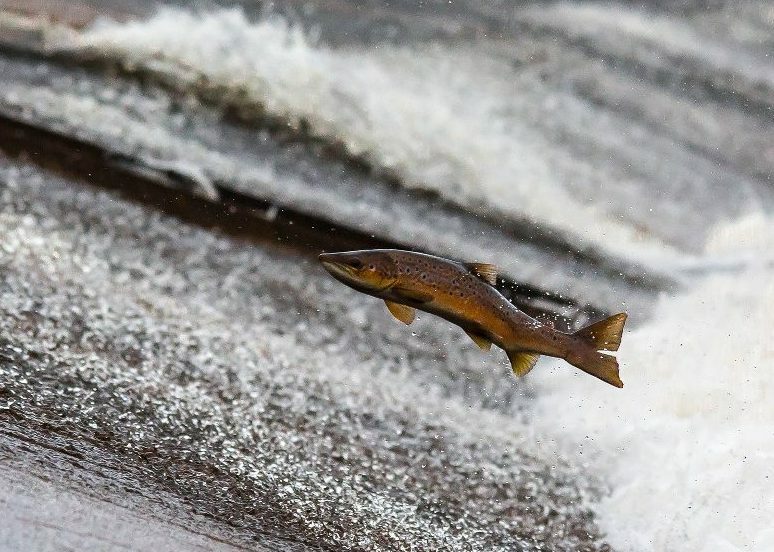 According to Chris, the data produced by the Station points towards the voracity of Morton’s most controversial cause regardless – that the open-pen farming of atlantic salmon in the area is doing significant damage to wild salmon stocks. Look at the Johnstone Straight on a map or chart and you’ll see that it forms a natural bottleneck between the islands located between Campbell River, Vancouver Island and mainland British Columbia – collectively known as the Discovery Islands – and the Broughton Archipelago that Fraser River salmon must swim through on their way to and from their spawning grounds in the rivers and creeks of coastal BC. Chris explained to me that the scientists of the Station are looking into a working theory that this geographical feature causes the uppermost, sunlight receiving layer of the water column (or “Photic Zone”) in the area to become “well mixed” and, as a result, to be naturally lower in nutrients than it might normally be. Sea lice are pervasive in the deep sea environment where they latch onto fish that are fully grown and able to withstand their presence, but the lice naturally die off by the time the fish get to the fresh water environment near their spawning grounds. According to Chris the fish farms have become “a sort of incubator” for lice in winter, where they infest farm fish, and spread into the wild environment where they attack vulnerable juvenile salmon as they work their way to the ocean, just at the moment when many are about to endure the nutritionally poor waters of the Johnstone, and the compound effect of this seems to be a factor in declining wild salmon stocks. He is not against aquaculture per se – but he does believe that open-pen salmon farming is causing real damage and is at pains to point out that this is where the data from the Research Station has been pointing for a while – data that is publicly available to anyone who wants to look. We talk about the potential for salmon hatcheries. His view is that while not perfect the US is handling the Alaskan salmon situation much better than Canada is handling ours. From Chris’s point of view, it looks a lot like Canada has given up on its wild salmon – worse, that the economics of the situation are tilted in favor of atlantic salmon farmed in open pens versus the preservation and expansion of the area’s wild salmon. That last part is not a view that I completely accept but I can tell you that Chris is not alone in holding it. Why else people say, would our government support the open pen aquaculture business in preference to the wild salmon stock? By Jason Murphy at Sealives. First Published 04/02/2018.